What everyone needs right now in these times of economic uncertainty and footballing disaster is a pick-me-up, so could a musical made up of ABBA songs be the answer? Mamma Mia! was already hugely popular in theatres when it was turned into the movie starring Meryl Streep, going on to become the third highest-grossing film of 2008 internationally. Now the musical breaks new ground by embarking on its first UK tour. It's the big show of the summer for Birmingham Hippodrome, where it stays until September 3. This original stage version follows the same storyline and songs as the film and even manages to recreate the white-walled curved Aegean buildings and dreamy aqua blue of the Greek islands but in a simpler form than the movie. Where it really excels though is in the music department with a fantastic orchestra and cast that can really belt out a tune. Lucy May Barker as Sophie has a tremendous, powerful voice as does Sara Poyzer, playing her mother Donna. Big dance routines to the music of ABBA in Mamma Mia! Set on a Greek island paradise, Mamma Mia! is based around 20-year-old Sophie who is yearning to track down her father on the eve of her wedding and invites three men named in her mum's diary as ex-lovers. There's romantic mayhem and hilarious fun with Sophie and her mum's raucous best friends arriving on the island to add some spice and humour to the nuptuals - but with catchy ABBA songs cleverly weaved into the plot every few minutes, it's hard not to like this feel-good show. 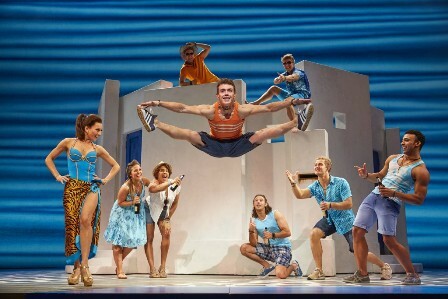 Hunks, romance and the hunt for a father makes up the story of Mamma Mia! The best scenes are when Donna teams up with her ageing and vivacious best friends Tanya and Rosie, whether it's them singing into hairbrushes to relive their youth to Dancing Queen or seducing some of the other guests to Take A Chance On Me and Does Your Mother Know. Their game-for-a-laugh, supportive characters are the essence of this story about strong friendships. The three men brought to the island end up being allies, there's husband-to-be Sky's mates and their stag do underwater escapades plus there's Sophie's best friends giving her a shoulder of support. It all adds to the air of optimism and playfulness. 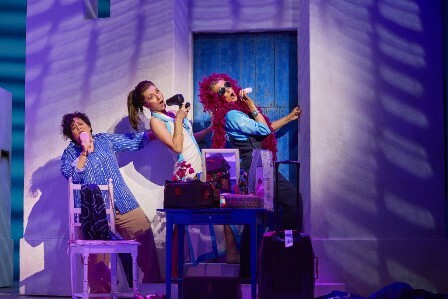 Grab your hairbrush for plenty of songs in Mamma Mia! But at the heart of this show's success is the music. Each and every ABBA song is a delight and there's even moments when you realise that some of the lyrics in these pop tunes have quite a complex, emotional layer too, like the heart-wrenching words to The Winner Takes It All when Donna confronts her long-lost love. By the time you get through to the close, you want it to carry on - and thankfully there's an encore repeating some of the hits plus a finale of ABBA's first single, the exhilirating Waterloo, which won Sweden the Eurovision Song Contest in 1974. Mamma Mia! is a bright, fun, euphoric musical with timeless songs that put a smile on your face, so why would you resist it? Running time: Approximately 2 hours and 30 minutes including a 20 minute interval. Tickets cost from £28 from the Birmingham Hippodrome website or by calling 0844 338 5000. Why? Cheer Up With The Romantic Feel-Good ABBA Musical Mamma Mia!